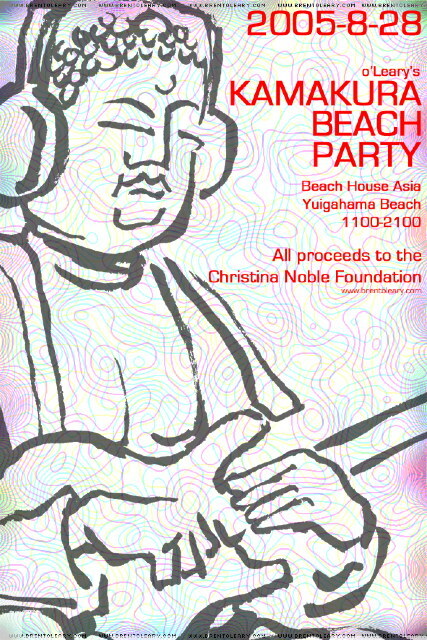 Just a quick advanced post to those who are interested in going to the 2004 Kamakura Beach Party on August 28th (Saturday). I’ve been speaking to event organiser Brent o’Leary a lot over the last few days, and the flyers are now ready, and pretty much all the information is on the website. The Kamakura Beach Party is an annual charity event, with all proceeds going to Make-a-Wish Japan and also just happens to be a great live event down on the beach. So get your t-shirt/bikini/umbrella and get down there. Tickets are available on the door (men: 3500yen, ladies 2,500yen).